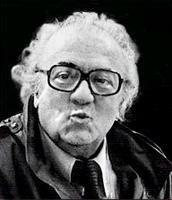 In 1978, Federico Fellini produced a small television film, Orchestra Rehearsal, which renewed themes, especially “the self-determining individual replaced by culturally constructed systems,1 from his then recent films: Satyricon (1969), The Clowns (1970), Roma (1972), Amorcord (1973), and Casanova (1976). In the last film, Casanova, Fellini seems unbearably cruel toward his protagonist, who constantly thrusts himself onto society in a series of exploits, primarily sexual, only to turn into a parody of himself. In the last scene, Casanova dreams of a former love as they dance on an icy Venetian canal, but Fellini will not even allow the dream to be uncorrupted as the legendary lover embraces a mechanical woman that had once seduced him. Under such a cold eye, Fellini analogously views his own artistic ambitions like Casanova’s romantic ones. 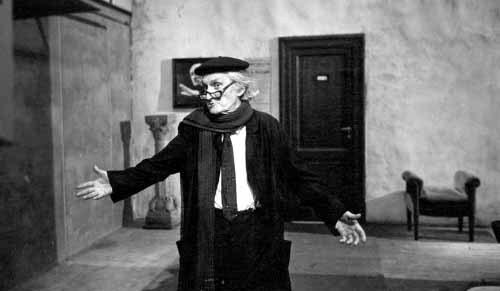 Paradoxically, the greater his skepticism about the role of art in society, during this same time all the above films’ titles started with Fellini’s own name. 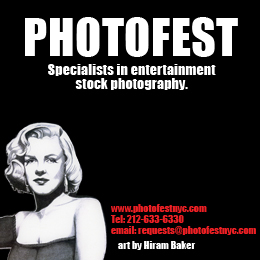 The more the artist recedes, the more his presence cannot be denied. 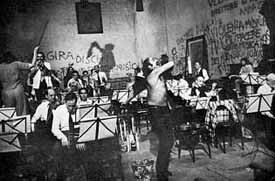 Orchestra Rehearsal continues the repression of individual identity and places nearly all its emphasis on the function of a group, the orchestra, which to a large extent stands for Society. 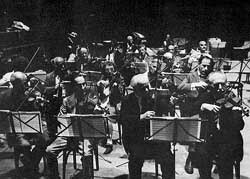 Potential protagonists, like the conductor, the lead violin, or the harpist, Fellini eschews, although much of the film explicitly details the individual relationships among the players and their instruments and how these relationships coexist within the orchestra. Indeed, the way the film describes the group seems a perfect dramatization of Georg Simmel’s sociology: society (the orchestra) is a crystallization of the individual interactions (musicians and their instruments). In particular, Simmel’s theories focus on the problematic relationship between individuals and society, while many of his essays describe many variables of this relationship. Much of the response to the film has centered on the allegory of contemporary Italian society as the action progresses from apparent harmony to dissent and revolt. Specifically, the ominous presence of the musician’s union and its influence on the orchestra make us aware how the function of one group conflicts with another related group from which little hope is seen for a harmonious relationship. The head of the union at one point says that the orchestra must take four players despite only needing one. The integrity of the orchestra, that is, its ability to produce the best music, means nothing to the Union. Another ingredient leading to the musicians’ dissension is the authoritarian German conductor (Balduin Baas). Several critics connected him to Italy’s fascist past, fueled by the film’s final scene when we hear the conductor reprove the orchestra, his voice slipping noticeably into a heavy cadence reminiscent of Hitler. The musicians’ revolt stems primarily from their irritation over having the music forced on them to play. Why can’t they do what they want? Why do they need to be told how to perform? All they need is a metronome. And even then a giant metronome is put in the conductor’s spot and knocked down because it too seems constricting. Their discomfort is little different from that felt by many people in nearly every society. Who gives anyone the right to do anything? People soon question the sources of authority. I have students who question the legitimacy of dictionary definitions. “Words are bogus,” one said to me. I asked her could she live up to her principles and, say, not care about spelling or word accuracy when she fills out college applications? Forlornly, she admits to a certain hypocrisy by not following through with her revolutionary assault on the basic social element but clings to the legitimacy of her dissatisfaction. Like my student by society, the musicians feel as if the best of what they are and create is being repressed by the force of the orchestra’s structure. Their rebellion turns into a combination of rage and playfulness, which finally expends itself amidst smoke and broken walls. The orchestra then regroups and continues its rehearsal. How much anyone learns from the experience remains to be seen. The feeling of heightened individuality among the musicians is an element of Gesellshaft or urban living. Ferdinand Tonnies categorizes urban life, compared to rural life, with some of the following elements: achieved status, evident social control, dominating self-interest, social interaction likely to be task specific, and performing tasks that subordinate relationships. All of these appear in the course of Orchestra Rehearsal and, perhaps, explain the film’s opening during which we hear the sound of traffic, specifically city traffic. The cacophony of street noises simultaneously portends the chaos arising from the musicians’ rebellion and suggests modern life as a sort of urban orchestra which, listened to long enough, starts to develop a rhythm and harmony. The hidden harmonies arise when we listen carefully to the many opinions and thoughts of the orchestra members as several give rhapsodic views of their instruments and meaning within the group of players. Others speak ungainly of the instrument sections. And a few simply refuse to be interviewed. Besides the traffic, another anomaly haunts the film. Every so often the building shakes as if the earth trembled. Only after the revolt reaches its apex does half the ceiling fall, killing the harpist, and a large wrecking ball is revealed. What does the ball represent? I immediately thought of Buñuel’s last film, That Obscure Object of Desire (1977). After Mathieu has been rebuffed by one or other of the Conchitas, we would see or hear an act of terrorism: a car exploding or being hijacked, the electrical power being knocked out, or a shopping mall blown up. Buñuel links Mathieu’s frustration to the violence; literally, his frustration manifests itself in the violence. In a cruder fashion, the recent film Phone Booth (2002) employs the same principle as its main dynamic. A man lies for a living (a publicist) and cheats on his wife. The public telephone rings, he picks it up, and society in the form of a madman starts putting him through the paces. In Orchestra Rehearsal, the quaking building manifests the orchestra’s shaky social ground. The musicians need the orchestra; the orchestra, the players. The message may seem an extraordinarily conservative one for Fellini — more so for Fellini partisans to accept such a message from the maestro. Society, its social forces, are intrinsically conservative, oppressive, authoritarian. The level of the pressure adjusts itself to each society and time. Fellini manages within seventy minutes to frame not only the time or historical element but to include a sense of passing generations. In the opening, the old copyist (Umberto Zuanelli) tells us that the building dates back to ancient times, was once a church, and several popes were buried there. 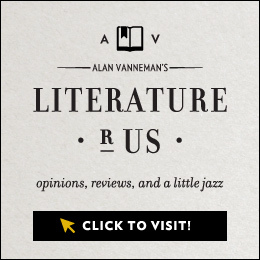 He mentions later how, 20 or 30 years ago, the musicians accepted strong discipline and criticism from the conductor; indeed, the players craved to have their knuckles rapped. Fellini has a laugh at this overly nostalgic view of the past, reminiscent of old-timers who think the world has become permissive. However, introducing this feeling that the recent past offered a stronger structure, Fellini mirrors the way we usually understand Society. What causes such a change in the breakdown of discipline, say? Should we blame the aforementioned unions with their self-serving rules? What about the bureaucracy that runs the organization funding the orchestra? Has the increased sense of individuality made us forget our connections to the group? On the other hand, the terms by which the musicians (people in society) function in the orchestra have changed. What seems a terrible development to one generation becomes perfectly acceptable to another. The union man (Claudio Ciocca) credibly lays out the benefits the union created for the musicians. Isn’t Society’s main function the protection of its members? An example of this change of terms Fellini shows with a repeated shot of one musician who listens to a football match on a portable radio. A good example because it dwells in a politically neutral zone. Initially, we laugh at this fellow, partly for the truth and absurdity it reveals about all of us, those who dwell in the metropolitan world. People sit in a subway car, stand in line at a market, jog, drive a car, but we often transport ourselves to a new circumstance by reading a newspaper, talking on a cell phone, listening to a radio or walkman, or playing a pocket-size video game. Our society’s technologically advanced media have fundamentally altered the terms of existence in society by freeing the individual from what Simmel calls the blasé, the routine, the job. An individual’s ties to Society have been weakened; we are free to roam or do something at any time we will. The rehearsal bores our orchestra member, but he has recourse to go to the soccer venue. Ties to the group are relatively loosened while his sense of self becomes relatively more fortified. The terms may change, but people remain stationary. The conductor expresses in his interview not so much nostalgia for the days when he was respected but a befuddlement over his present situation to which he resigns himself. Tellingly, he feels himself as a king and practically a sergeant-major, only as the latter he can no longer dominate them without being worried about some form of grievance that will be taken seriously. His only solution is to berate the musicians and yell louder. In the end, he too blames the union. Orchestra Rehearsal‘s best parts are the interviews when the musicians explain and glorify their functions, often at the expense of the other instruments. We see the pure joy these professionals get from their craft (most of them are unlike the bored player who listens to the radio), as well as suffer their petulance that the world of specialization creates. The micro-level of society works itself out similarly. The individuals strive to give meaning to their craft, their reason for being, often by making some kind of sense of what their role is in the orchestra. Most of them find ways to glorify themselves: violins and bass players, pianist, the horns and trombones. The purest “Fellini” types — tuba, bassoon, drum, and harp players — are represented as outsiders if not freaks who derive their essential identity from their sense of their own oddity or uniqueness. As they explain themselves, often giving us a sample of their sounds, these individualist instrumentalists achieve a form of indispensability. Never far away, though, are the interactions that individuals inflict upon one another. Two players fight over the position of their chairs for leg room, while another two move the musical score back and forth to see it better. When the overweight harpist enters the room, several of the instruments play a theme deriding her heavy walk. The only one who seems absent from this model social group is the music’s composer. As most commentators on the film have noted, this was Nino Rota’s last collaboration with Fellini. He composed the musical pieces that the orchestra plays. The absence initially affirms the idea of the repressed individual creator. The composer’s music is the very thing the musicians are trying to free themselves from. 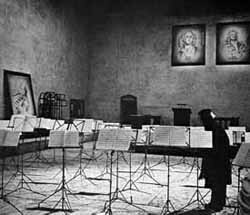 Fellini uses the musical art to refer to the greater society, then has us come back and reflect on this art: namely, the film Orchestra Rehearsal. In a sense, all works of art contain their own interpretation of the function of art. Like the music rising above the smoke and dust, as if it were a form that individuals can recover for some kind of elemental unity, so too Fellini takes us beyond our frailties and chaos. We cannot free ourselves from religion, from art, from Society. In a sense, his films, especially the one under consideration here, are Society rehearsals, readying individual members of the audience to conduct themselves and be conducted more wisely in a restricted if not repressive world.